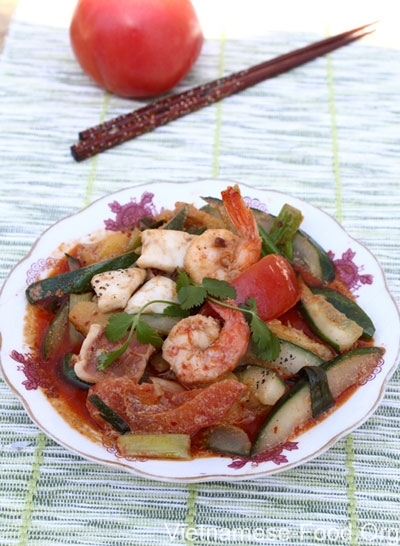 The sweet of cucumbers, tomatoes and pineapples are fried together will make the dish is more charming. Green onion, fish sauce, salt,MSG, pepper and garlic. -Squids are washed ,reject squid gall, squids are cut into thin slices. -Shrimps are washed, reject shrimp shells,shrimp tails are retained. 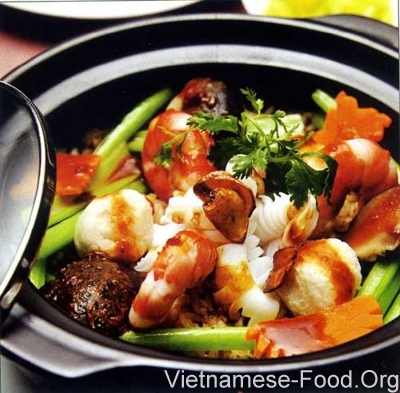 -All mixed vegetables are prepared in advance then put to the disk. -Pour two teaspoons of cooking oil into the frying pan and turn up the heat to high.when the cooking oil is hot,add the garlic,then add the squids and shrimps to the pan to fried quickly. -Pour two teaspoons of fish sauce,a little MSG, salt, pepper to the frying pan,the next, add the vegetables to the pan,you should try to this dish again( depend on your taste). Stir-fry about 5 minutes, turn off the heat,add the green onion to the pan to stir. -Severed with cooked rice when the dish is still hot.